Anti-Corruption Force Operations Director Namal Kumara yesterday said he would reveal more incidents including an alleged land fraud taking place in the country. 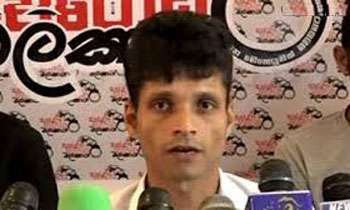 He expressed these views to the media after giving a statement to the Criminal Investigation Department (CID) over the ongoing probe into alleged assassination plot on President Maithripala Sirisena and Gotabaya Rajapaksa. Kumara said he handed over some recordings to the CID when he was summoned to give a statement yesterday. He said the next expose would be about an alleged land grabbing fraud taking place in Sri Lanka. “As of now, I’m collecting evidence. I challenge anyone to find information if they can about this fraud. We will also make an expose on a fraud taking place when importing goods to Sri Lanka. We cant expose all at once. We will take our time to collect evidence and then reveal them,” he said. Has this guy become the "Jamis Banda" similar to James Bond? EXPOSE without fear . DEALdasa is for sure in this land grab drama . What a bunch of POLITRICKSTERS . Lovely !!! Are we the detectives of the crimes in this country? What is the game this guy is playing? Grabbing the lime light so he could seek political asylum in a Western country later on? What is this fellow going on about ? Why didn't he expose these before? Keeping them for a rainy day or until someone offered him money? he is using media to do his politics. Considering the sheer volume of information this guy has,state intelligence must be having a deep nap. No point because they will come for the inquiry to the CID or FCID and go. Again, they will come and go. They will be arrested and again will come to courts and go. Come and Go Law. Sri Lankan law. This man must have been paid in Millions for his acting in front of Camera.Media loves him so much. What is his level of Education? Is he from American CIA or UK MI5 ? or from Pera-Hotu-gami or Wee-rawansa-gami ? May be he will contest the next presidential election! this guy too might be a RAW agent himself.